There is more to rope exercise than tug-of-war or assault courses. 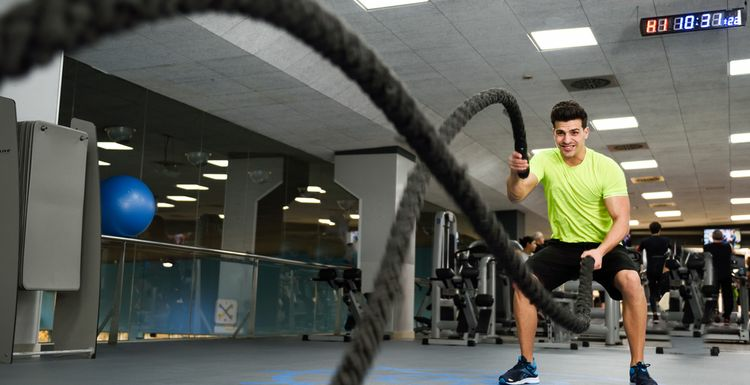 Try ‘battle ropes’ for a great upper body and core workout. The idea is to create waves in a pair of ropes that are firmly fixed at one end. The usual rope length is around six metres, and they are generally around 5cm thick. It is also possible to use one longer rope attached at its halfway point. Many gyms now have battle ropes, or you can create your own. Make sure you have a sturdy anchor point because there will be a lot of strain on it. The low-space alternative is to use sheets, but do clear nearby shelves first! This is intense, so don’t be surprised if the workout is short. Begin with alternating waves. Simply raise and lower each hand to create waves in the rope, allowing a little side to side body movement. Keep your head up and your core engaged. Now add steps to each side, keeping the waves going. (make sure you have enough room!). Now return to the centre, and raise and lower both hands together to make matching waves. (This is the ‘stagecoach’, as if you were encouraging a reluctant horse!). Toughen it up by stepping back into a lunge while keeping the ropes moving. Finally, move your arms from side to side to create horizontal waves in the ropes. If the ropes can be unfastened, try some battle rope partner exercises, with one person at each end of the rope pair. Get in rhythm together to create the alternating waves, then try a ‘partner slam’. One person raises both ropes high and then slams them down to send a wave to other. The second person then tries to send the wave back. No partner? Untie the ropes and ‘climb’ them with a horizontal pull. Their weight will give you a good workout. Buy your own or use the ones at the gym – the ropes will help you win the fitness war. Personally I have never seen these at a gym, but then our gym is quite small. I would love to try them - please can all gyms get a set! it looks a lot of fun from the photos! I have seen these in the gym so I'm now inspired to give them a try. I have tried these and believe me they are amazing for your abs, arms and shoulders. And it's so cathartic too - definitely recommended.